Model F1145 is heat pumps / 1245 brine / water or water / water have even greater energy efficiency, lower costs for heating and hot water, as well as a lot of flexibility in the management than the F1126 / 1226. "You can solve a lot of problems with the help of additional accessories - heated pool, air conditioning, and other built-in Internet -.. 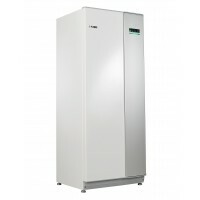 Monitoring To NIBE F1145 heat pump can be connected to an external hot water boiler of indirect heating in turn NIBE F1245 has a built-in boiler capacity of 180 liters.. NIBE F1145 / 1245 Heat pumps can be connected in cascade to 9 units.